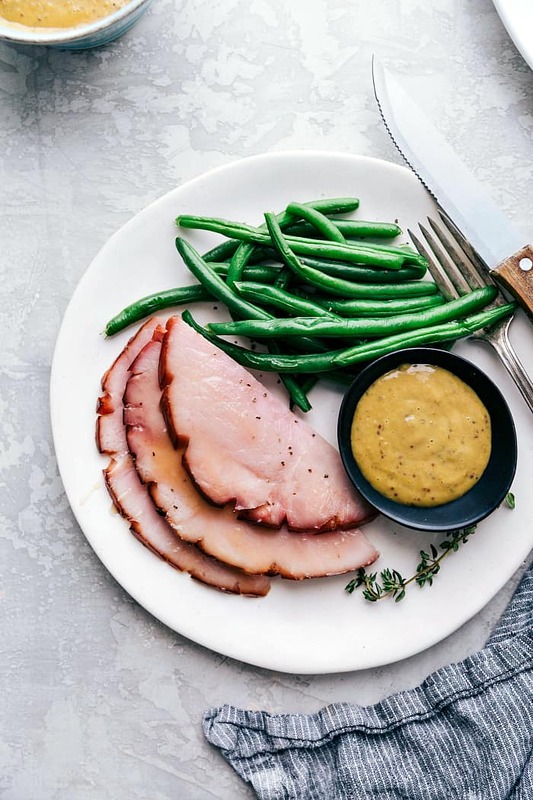 Honey Glazed Ham is a one of my favorite meals during the holidays! I love the smell of it baking in the oven, the juicy first cut and the warmth it brings in our home and our hearts! It is a comforting meal that is sure to please everyone gathered around your table. 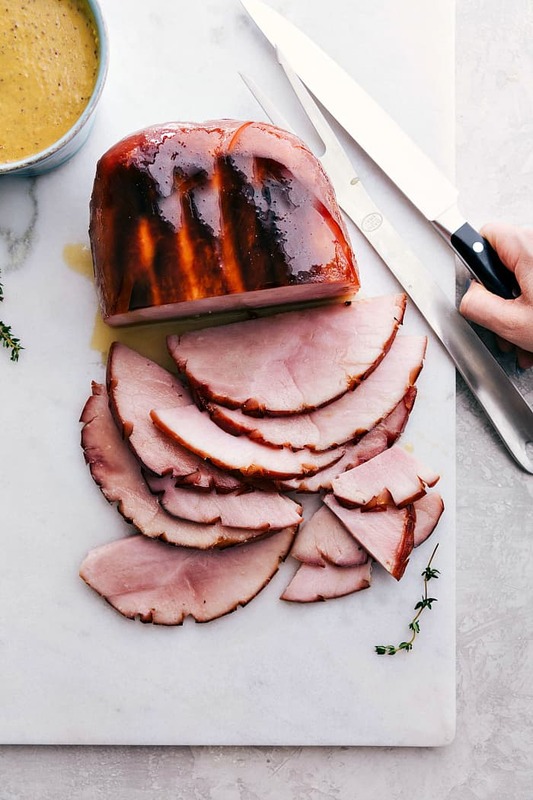 This Honey Glazed Ham has all the feels around the holidays. It is a classic tradition in most homes and carried on from generation to generation. I am a tradition kind-of girl and love this Honey Glazed Ham with a few of my favorite side here: The Best Funeral Potatoes, Garlic Parmesan Green Beans with Bacon, and Perfect Soft and Buttery Rolls. Lately I have been craving ham. Isn’t that weird? I couldn’t wait to bake this ham just so I could eat it with my family and have leftovers. I have been eating ham sandwiches almost every day and I can’t seem to get enough of it. This baby has been having some weird cravings. From fruit, to ham. Pretty opposite if you ask me! A lot of people ask me questions on how to bake the perfect ham. 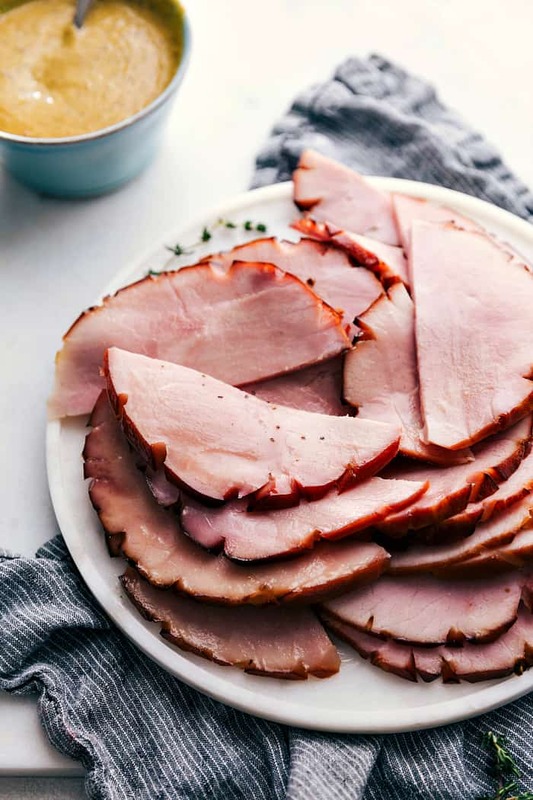 It is pretty simple but there are a few tricks to get your ham to taste fantastic. My favorite glaze to use is a simple honey glaze and it gives the ham a perfect sweet flavor. Here are a few tips that I go by when cooking my ham. How do I cook a precooked ham? Take the ham out of the refrigerator and allow it to rest 30 minutes before cooking. Preheat the oven to 325 degrees. Prepare the glaze by heating honey, butter, dark corn syrup, and brown sugar in a medium saucepan on medium low heat. Line a 9×13 inch pan with aluminum foil. If scoring the ham, lightly score the top into diamond shapes and place the ham in the pan. If using whole cloves, put them in between the lines you scored, but remove before cutting and eating. Brush the glaze on top and create a foil tent over the ham. Bake the ham according to how many pounds you have. Usually 15 minutes per pound. Brush the glaze over the ham every 15 minutes. 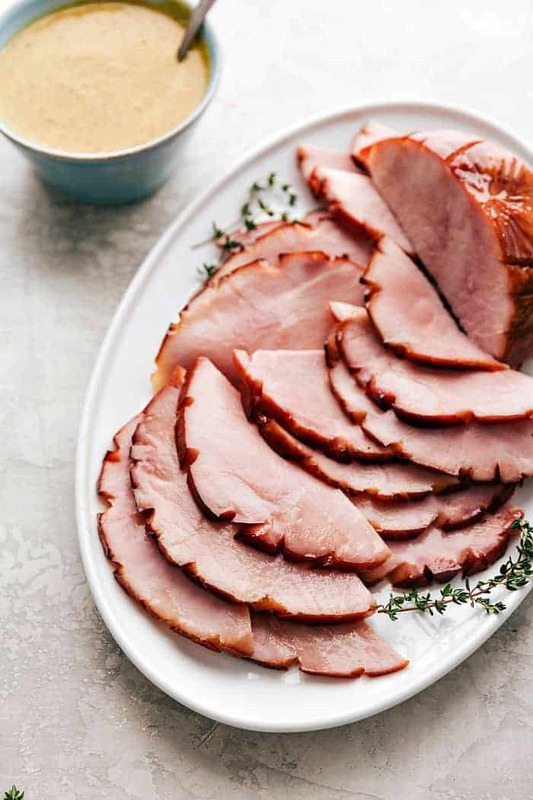 Once the ham is cooked, remove the foil tent and caramelize the top by turning the oven to broil and letting the ham get dark for about 3-5 minutes. Remove the ham from the oven and pour remaining glaze over the top. Scoring your ham: Before I cook my ham, I score the top in diamond shapes. This not only adds a beautiful presentation, but allows the glaze to seep into the ham. You can also put whole cloves into the cracks, but remove them before carving and eating. 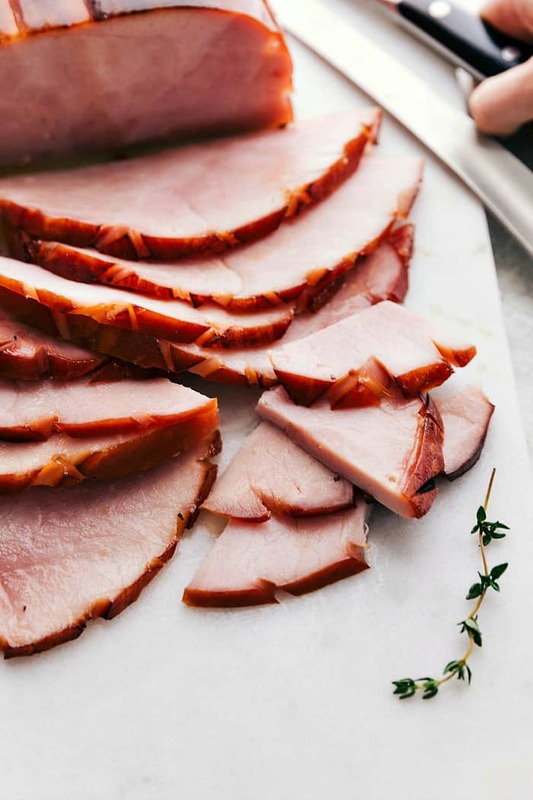 Cutting the Ham: Once your ham is fully cooked, it can be served at warm or cool temperatures but never straight out of the oven. Let the ham rest for about 10 minutes before cutting. And ham can be stored in the refrigerator for up to a week. Can I cook a ham overnight? Yes you can. You just need to preheat oven to a lower temperature around 275 degrees. Place ham in a roasting pan and score the skin on top. Bake uncovered for 7 hours. Spoon half of the glaze over the ham and baste, cooking it for an additional 1 1/2 hours. Do you cook a ham covered or uncovered? After you brush the glaze over the ham, create a foil tent over the top as the ham bakes. Once the ham is cooked, remove the foil tent and caramelize the top by turning the oven to broil and letting the ham get dark for about 3-5 minutes. Remove the ham from the oven and pour remaining glaze over the top. 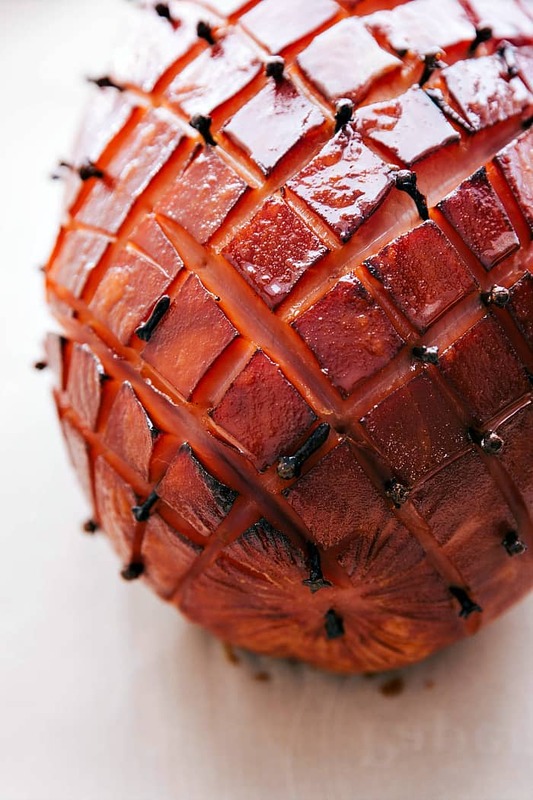 Do you glaze the ham before cooking? Yes. I glaze the ham before putting it in the oven, and continue to glaze the ham every 15 minutes. Brush the last of the glaze on the ham and turn the oven to broil and let it caramelize the top of the ham. Should I slice the ham before cooking? No. This will dry the ham out since it is already precooked. Just score the top before cooking. 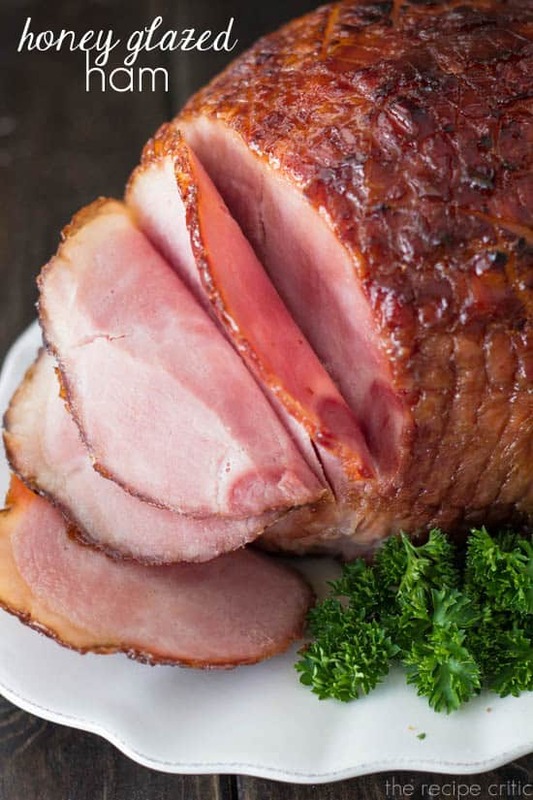 A delicious sweet honey glaze that gives your ham the perfect flavor! Take ham out of the refrigerator and allow to rest at least 30 minutes before cooking. Preheat oven to 325. Prepare the glaze by heating honey, butter, dark corn syrup, and brown sugar in medium saucepan on medium low heat. Line a 9x13 in pan with aluminum foil. If scoring the ham, lightly score the top into diamond shapes and place the ham in the pan. If using whole cloves, put them in between the lines you scored, but remove before cutting and eating. 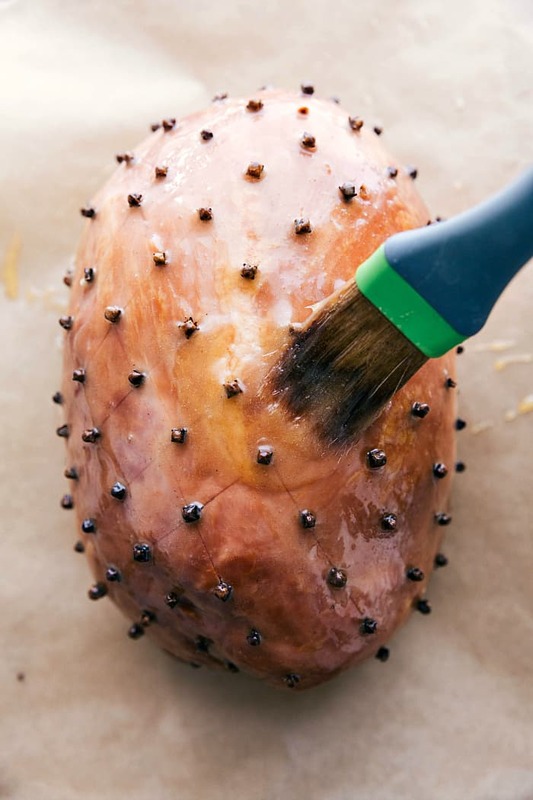 Brush the glaze on top and create a foil tent over the ham. Bake the ham according to how many pounds you have. Usually 15 minutes per pound. Brush the glaze over the ham every 15 minutes. Once the ham is cooked, remove the foil tent and caramelize the top by turning the oven to broil and letting the ham get dark for about 3-5 minutes. Remove the ham from the oven and pour remaining glaze over the top. Cut into thin slices and enjoy! I made this last night and it is FANTASTIC!!!! I don’t usually cook with ham, but it was too tempting to pass up….. and it is damned delicious!! Thanks for sharing such an awesome recipe!! 1. What kind of ham? 2 How long to cook? I have given up cooking Hams, due to them alway being fatty or coming out dry! Your pictures are fantastic! I’m going to try this for Christmas dinner this year. Can you tell me what your mustard?! concoction is? It looks heavenly and I would be in heaven. (Yes, i’m a dipper).